How much are you paying each month on your cellphone? Cellphone bills can be expensive, on par with the monthly costs of powering your home or keeping your car gassed up. Of course, your cellphone can help you build your credit, but only if you aren’t strapping yourself with too large a bill every month. So if you’re sick of shelling out a small ransom to call, text and watch YouTube cat videos on your smartphone, you should know there are ways to lower your cellphone bill. Here are 12 options. If you’re signing up for a new cellphone plan, make sure you’re only paying for the plan you need. Unlimited texting, calling and data plans are nice, but you may use your phone less than you think. Take a look at your phone usage over the past few months to determine if average usage is way under the allowances you’re paying for. If so, you can save some money by switching to a downgraded plan. This was my first step to cutting my cellphone bill. I went from $100 a month to $75 a month. Many wireless carriers like Verizon and AT&T dangle the carrot of a new phone upgrade every year or so. Of course, you like new devices, but you might end up shelling out hundreds for a new phone or rolling the cost into your wireless bill, which sounds tempting in the store but will add to your monthly cost. If your current phone works, hold onto it to save money. Plus, the new features on a brand new phone don’t tend to be revolutionary. You can skip a few generations and buy a used phone in a few years and have close to current technology and features. Device insurance sounds appealing when you’re about to drop hundreds on a new phone. But in many cases, it isn’t worth the cost. “At $11 per month from Verizon, you’d still need to cough up an additional $50 to $200 for the deductible, depending on your device. It’s more cost-effective to invest in a sturdy, protective case and screen cover and treat your device with care,” said Kendal Perez, Savings Expert at CouponSherpa.com. It’s also worth checking with your credit card issuer to see what, if any, kind of extended warranty options they offer on new purchases made with your card, or if you pay your cellular bill with your credit card. Learn more about your options with this handy guide to getting your money back when you break or lose your phone. If you need more than one phone line on your plan, you may want to check if your wireless carrier offers family plans to lower your cellphone bill. Family plans offer savings for additional phone lines, decreasing the average cost of each line. In some instances you may be able to split the costs with a friend or family member you trust. Seriously, don’t do it. Wireless carriers often impose steep fees when you surpass your data limit, so if you’re regularly bumping up against your limit, you may want to comparison shop for an unlimited plan. It could end up being cheaper than going over your limit several times. If that’s not an option, consider reducing your data usage. Use secure Wi-Fi wherever available, especially when you’re engaging in data-heavy activity like downloading podcasts or watching videos. If you can reduce your data, you can potentially switch to a plan that charges less. “Unlimited data plans are making a comeback…however, it’s better to track your usage and pay for the data you actually use. Compare plans between carriers and read the fine print,” said Perez. Many providers charge for things you’ll never use or already have, such as emergency roadside assistance or 411. Next time you get your bill, go through every fee and charge to make sure you know what you’re paying for. Some unused services could be removed from your bill. Also be sure to check for any charges that you never made. Cramming is real. Many employers and jobs have discounts available with major wireless carriers. Examples may include active-duty military members or state government employees. Find out if your employer or wireless carrier participate in such plans. This is another area where I was able to save money. My company offered a 6% discount on my monthly bill. It wasn’t much but was better than nothing. If you have a home business and use your phone to conduct business calls and emails, you can deduct some or all of the cost of your wireless plan at tax time. This will indirectly lower your cellphone bill. You also may conduct business on your personal phone for your employer. This could include phone calls, email and any other work activity. Ask your employer if they participate in phone reimbursement or cost-sharing policies. Like many other service providers, wireless carriers face stiff competition from other wireless giants and smaller providers. As a result, they may be willing to negotiate to keep your business. Call your wireless carrier, tell them your bill is too high and that you’re thinking of switching to another provider. You may want to be ready with offers from other wireless carriers, and you’ll have some negotiation power if you’re a long-time customer and always pay your bill on time. Also, keep in mind, the better your payment history, the better chance you have of negotiating, so don’t wait until you’re making late payments to begin talking. If you’ve already made some late payments, for your phone or other bills, you can see how they’re affecting your credit scores by reviewing your free credit report summary. Competing wireless carriers are constantly trying to lure customers away from each other. If you can find a better offer from another carrier that provides the service you need, you have a compelling reason to switch. You can even look for budget alternatives, such as prepaid plans. “Prepaid, no-contract plans from Boost, Virgin Mobile, Ting and Page Plus are all cheap alternatives to big-carrier plans… compare costs between big carriers and no-contract providers before you buy. At the end of the day, this was the best move I made. I switched to Cricket and dropped my bill down to $35 a month. And I have more data than I did before! You can sign up for Cricket using this link and get a $25 statement credit on your first bill! So there are 12 easy ways you can lower your cellphone bill today. 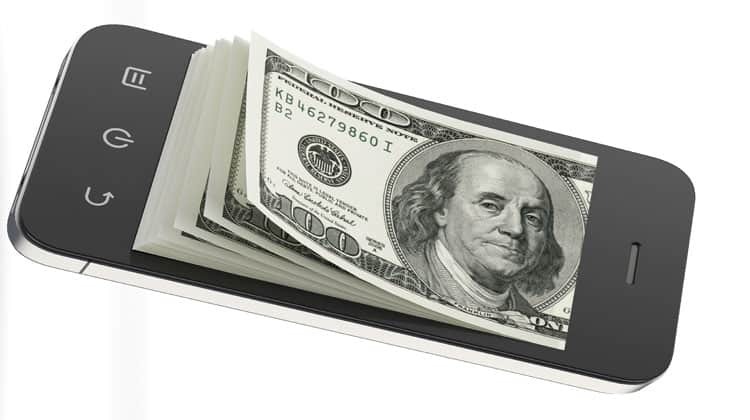 For many, your cellphone bill eats up a good amount of your monthly income. Do something about it and save some money. It’s easy to do and will only take you a few minutes. Even saving $50 a month comes to $600 in savings every year!